The Kitchen or operating room? – Hello Korea ! The Kitchen or operating room? The Kitchen or operating room?, originally uploaded by Almost-Human. 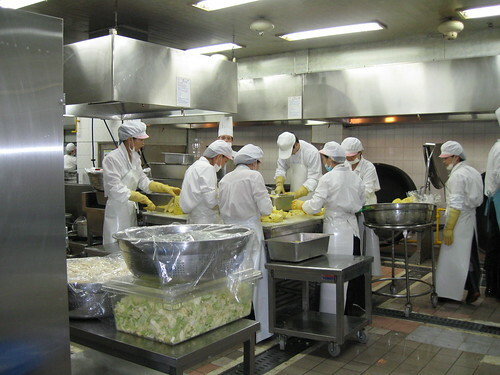 Here’s the kitchen staff, operating on pineapple for our lunch. In my first year in Canada, I knitted a little mask to wear in case I would catch a cold or flu. In Korea, we used to wear a mask in public places to not spread flu. In some schools where kids could have lunch together, kids who were serving others also wore those masks. Of course, I never wore it for two reasons: it didn’t take me long time to notice that nothing was same than in Korea, the best country for me at that time, and nobody was acting like Koreans, the best people of the world for me at that time; and it didn’t take them long time to assimilate me completely and I began to think that it was laughable to wear a surgeon mask. Oh THAT’s why they wear those things! People still wear them here. I see them occasionally. They even sell them in pint-sized form for children, with little cute characters printed on them.